Career Coach, Author, Relentless Optimist. Get clarity, direction, and balance along your career path and life. While chatting with a friend last week, the topic of New Year's resolutions came up. "So, how about your resolutions for 2016?" I asked her. "Umm, well, you know... they never stick," she replied. Yep. Pretty much the same response I get from most of my friends. Each year many of us create promises to finally use that gym membership, or start reaching for fresh fruit and not the donuts, but our great ideas often become old news by mid-February... at least in our heads. I recently read a social media post by a young man who explained how New Year's Eve was the time to "mentally delete" all his bad habits from the previous year. He felt that by erasing his mistakes, he might be freed of them. While I understood his perspective, I didn't agree with his philosophy. Bad habits can't simply be deleted, but they can certainly be replaced. So, what gives? 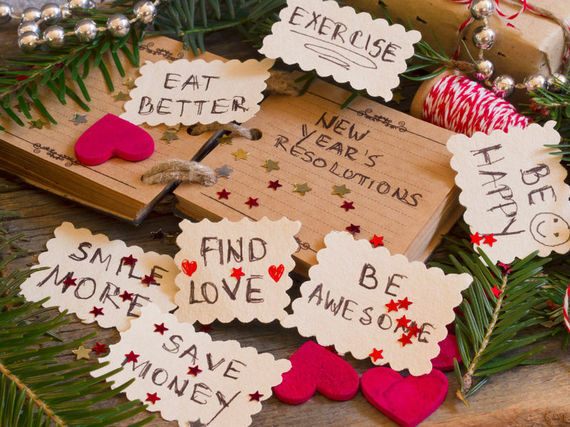 Why is it so hard to keep our resolutions? Because with resolutions, we focus on our actions and not our intentions. Intentions are on a higher plane than actions. Intentions are about changing our core behaviors and the way we view ourselves from a deeper perspective. We can accept our mistakes as lessons and learn to focus forward instead of looking backwards. A few years ago, I made the decision to stop creating New Year's resolutions and, instead, set intentions. To me, the word resolution implies the "resolving of problems"--and going back over my last year to clean up problems or forgive myself of mistakes felt heavy and blaming. Setting intentions felt much more positive. For example, instead of making a New Year's resolution to go to the gym more often, I set an intention to keep my body healthy and strong--including paying attention to what I eat and how often I exercise. This way, I can choose a variety of ways to match that intention--whether it's going to the gym, taking a long walk, eating new foods, or creating a new healthy habit I haven't even thought of yet. According to Mike Murdock of the Wisdom Center, "The secret of your future is hidden in your daily routine." Behaviors are a consequence of routine, and since our lives are always changing, so are the patterns we create. To find a better balance in our daily routine, we can even try living a day by the doctor's orders. Setting intentions gives us higher goals and more choices that can benefit our whole well-being. • What are you predominantly thinking about? How are those thoughts serving you? • What feels hopeful when you think about it? What feels possible? • Remember: We can choose which thoughts we focus on. • Is your health where you'd like it to be? If so, how do you maintain this momentum? • If not, what would you like to change about your health? • Remember: We are what we eat, drink, feel, and think. • Are you comfortable with your feelings of purpose and direction? Are your relationships with others joyful and fulfilling? If you've answered 'no' to either question, how might reconnecting with your inner being help you find better balance? • Remember: Taking a few minutes to be quiet, breathe, and relax in silence each day can make a significant difference in our feelings of purpose and connectedness. One last suggestion: Think short, attainable goals to support your intentions. For example, in response to my intention to keep my body healthy and strong, I might plan a goal: "Starting on Monday, I will take a brisk walk during my lunchtime at least three days a week." Always make it something measurable and possible. Think of what you'd like to intend for your life during this next year. Start here--start now, and even before the clock strikes 12 on New Year's Eve, you will have already set yourself up to make it a happy new year.